JFK meeting with Admiral George Anderson in the Oval Office on October 29, 1962. Kennedy had the tapes rolling. In this excerpt from a conversation that took place over a year after the Cuban Missile Crisis, Secretary of Defense Robert McNamara passed on something that Admiral Hyman Rickover had told him recently: that during the Cuban Missile Crisis, Admiral George Anderson, the Chief of Naval Operations, had been insubordinate during the crisis. It was at the tail end of a longer discussion about the defense budget, Congressional hearings on the nuclear stockpile, and a proposed nuclear carrier. As the conversation wound up, McNamara engaged in some score settling. Kennedy clearly wasn’t much troubled by McNamara’s charge. He knew well that McNamara and Anderson were engaged in a long-running feud–it had even spilled out into press reports. Tension between the two had started almost as soon as McNamara took office. Well before the crisis, Anderson had become resentful of McNamara’s so-called whizz-kids meddling in navy affairs. One incident occurred. We knew where one of these particular submarines was located. We had that information from the most highly classified intelligence that the navy had at the time. We were very anxious to preserve that intelligence, and very few people know about this type of intelligence. We had a destroyer sitting on top of this submarine. One evening, McNamara, [Roswell] Gilpatric, and an entourage of his press people came down to flag plot and, in the course of their interrogations, they asked why that destroyer was out of line. I sort of tried to pass it off because not only were there some of McNamara’s people there who were not cleared for this information, but some of my own watch officers were not cleared for it in the general area of the flag plot. 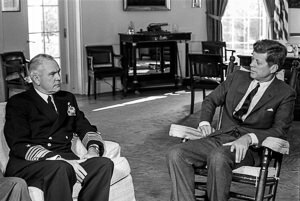 After some discussion, I said to McNamara–he kept pressing me, ‘Come inside,’ and I took him into a littler inner sanctuary where only the people who had clearance for that particular type of classified information were permitted and I explained the whole thing to him and to his satisfaction, as well. In the winter and spring of 1963, when Anderson publicly disagreed with McNamara’s defense budget in congressional testimony and criticized his stance on the controversial TFX fighter plane, relations between the two became even worse. During the summer of 1963, McNamara pushed for Anderson to be fired. Kennedy resisted an outright firing but decided not to reappoint Anderson as CNO and instead send him to Lisbon as the U.S. ambassador to Portugal. He took up the post in August. It’s not clear precisely when this conversation took place, but based on the recordings around it and the president’s schedule, it was probably either November 8 or 12, 1963. Robert McNamara I talked to [Admiral Hyman] Rickover in connection with this nuclear carrier. And while we were discussing it, he said, "You know," he said, "[Admiral George] Anderson was absolutely insubordinate during the Cuban [missile] crisis. He consciously acted contrary to the President's instructions." I just thought you'd be interested to know this. McNamara This is what Rickover told--Rickover told me ten days ago. JFK I wonder what he--what did he mean by that? McNamara Well, I didn't want to probe too much. JFK He wanted to sink a ship? McNamara He wanted to sink a ship. That’s right. [chuckling] That it was none of your business or my business to say whether he should or shouldn't. Tape 120/A56, President’s Office Files, Presidential Recordings Collection, John F. Kennedy Library. Transcript by David Coleman. 1. “The Reminiscenses of Admiral George W. Anderson Jr, U.S. Navy (Retired),” volume 2, (Annapolis, Maryland: U.S. Naval Institute, 1983) p.495. 2. “The Reminiscenses of Admiral George W. Anderson Jr, U.S. Navy (Retired),” volume 2, (Annapolis, Maryland: U.S. Naval Institute, 1983) pp.558-59. 3. “The Reminiscenses of Admiral George W. Anderson Jr, U.S. Navy (Retired),” volume 2, (Annapolis, Maryland: U.S. Naval Institute, 1983) p.544.